Google Voice has been out and available for a while now. I am not too sure how it would benefit the entire world. So far, it seems to be geared towards Canada and U.S. users. Whether Google expands or intends to provide more service to the rest of the world or not I don't know for sure. I can see how Google Voice might be more appealing to land line users both home/personal and businesses. However, there is certainly features that could come in handy for cell phone users too. Google Voice has an online web interface to send and receive free calls anywhere in Canada and the U.S. It can also be used from any phone to make a free call. You can choose a phone number in a variety of cities that will forward calls to a number of your choice (your home phone, cell phone, business, etc. or all of them). You could potentially select a number in another city, state, province, etc. that would be a local calling area to say your friend, family, business target area. They could call you for free basically. You can also use it with a local number to your area. 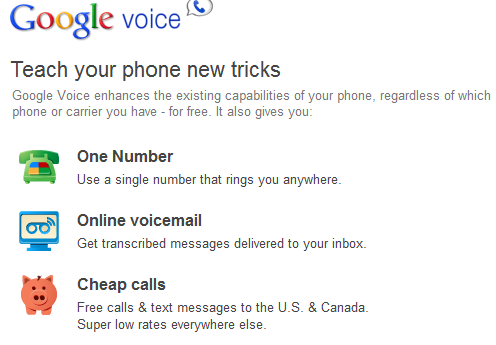 Then, simply call your own Google Voice number, select make a call, and call anywhere in Canada or the U.S. for free. You can call other countries for very cheap and competitive rates as well. It has a bunch of features including texting. Google Voice is a little confusing or difficult to comprehend, but it has a lot of potential for all types of users. I haven't used it enough to say I can't live without it or anything, but I am fairly certain that I will get some use out of it. Which has always brought up concerns over what they do with your information. The voice mail part of it somehow transcribes voice into text and sends it to your inbox. I have a feeling that they will use the information contained in these to provide targeted ads, similar to what they do with gmail. They scan gmail messages for text and keywords. Then, they serve up ads based on that. So I wouldn't be surprised if you didn't see something similar like this in Google Voice. Then again, they have to pay for it somehow I guess. At any rate take a peek at it sometime if interested. Like I said it does have potential.